SNAP is a federal benefit program that puts food on the tables of low-income households. SNAP recipients in Pennsylvania use an Electronic Benefits Transfer (EBT) card, also known as ACCESS. This card works like a debit card and can be used at grocery stores, supermarkets and some farmers markets. SNAP benefits buy food items or seeds and plants to grow your own food. The SNAP program will look at all kinds of factors to determine your eligibility, like whether you have an elderly or disabled person living in your household, your savings account, medical bills, etc. Eligibility is also based on monthly income and expenses. Looking for ways to help get out the vote before November 4? Join Voter for Homes for their final voter mobilization training and for phone banking! Phone Bank, Thursday, October 30th, 5:30pm - 8pm (Mental Health Association of Southeastern PA, 1211 Chestnut St.)Phone Bank, Sunday, November 2nd, 5:30pm - 8pm (Project HOME)Phone Bank and Rides to the Polls, ELECTION DAY, Tuesday, November 4th, 8:30am - 8pm (Project HOME) Vote for Homes is an ongoing effort to mobilize voters by supporting the voting rights of people who are low-income, homeless, living with disabilities, or formerly incarcerated. Election Day is November 4! Don't forget to go to the polls on November 4! Your vote matters more than ever, especially when it comes to the policies that affect women, girls, and families like the ones we serve every day. If you live in New Jersey, please visit http://nj.gov/state/elections/index.html for more information (including information on voting by mail).If you live in Delaware, please visit https://ivote.de.gov/. If you live in another state, or have questions that are not answered in this post, please visit http://www.vote411.org/. On November 4, you will be able to vote for candidates running for Governor, the State Legislature, and the US House of Representatives. There may also be special ballot questions and local elections. You can look at a sample ballot for your polling place at SmartVoter.org. Register here The Food Research and Action Center (FRAC) and Tyson Foods recently conducted a poll to measure attitudes and perceptions on hunger and its solutions among voters. Join us for a webinar to go over the findings, which show that Americans firmly believe hunger is a serious issue facing the nation, that its impact is widespread, and that government is key to solving it. PHILADELPHIA, PA - Philadelphia Business Journal announced that Catherine Sennett, Esq., PathWays PA’s Board Secretary, has been selected as a 2014 Women of Distinction award recipient. Sennett will be recognized along with the region’s most dynamic women on Tuesday, November 18, 2014 from 5:00pm to 8:30pm at Vie, a Cescaphe Event Group Venue, 600 N. Broad Street, Philadelphia, PA.
Support PathWays PA Through Your Workplace! If you participate in any of the following workplace giving programs, please consider using your money to support PathWays PA. Here is the information you might need. Please feel free to contact us with any questions! United Way of Greater Philadelphia and Southern New Jersey: 01619Combined Federal Campaign: 16357Pennsylvania SECA: 4113-0006Penn's Way Campaign: Designate UWGPSNJ and our United Way number, 01619 Don't have a workplace giving program? You can donate directly to PathWays PA at https://npo.justgive.org/nonprofits/donate.jsp?ein=23-2001837. Job openings as of October 22, 2014. To submit your resume online, click here. Please remember to indicate the position you’re applying for with your resume. Homelessness is an issue that we see often at PathWays PA. Our residential programs work with homeless families and girls to give them an opportunity to stabilize their lives. As this policy brief from People's Emergency Center shows, the need for such services is growing. This policy brief, based on reports from the National Center for Homeless Education, the United States General Accounting Office, and the Pennsylvania Department of Education, shows that the number of children and youth experiencing homelessness has now exceeded 1.26 million. In 2013 19,459 children and youth in Pennsylvania experienced homelessness.The number of homeless students enrolled in pre-kindergarten through 12th grade increased nationally by 8% between 2011-12 and 2012-13 school years.Most homeless students are living doubled up with other families, not in shelters or in the outdoors. Read the full report here. Project HOME is beginning to collect names of the homeless who have passed away and will be remembered this year. Please start collecting those names, and pass them, along with all helpful information, to Kaitlyn Snyder at kaitlynsnyder@projecthome.org or 215-232-7272, ext. 3031. Celebrate National Work and Family Month with a Facebook chat about the need for paid family and medical leave this Thursday, 10/23 from 1-2 pm. 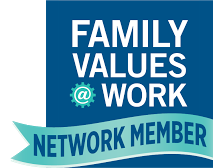 The chat will be co-hosted by the National Partnership for Women & Families, MomsRising, CLASP, Family Values @ Work, and Working Mother magazine, on behalf of the FAMILY Act coalition. 6/16/14 - FAMILY Act Week of Action Starts Today!2/5/14 - We’ve Come Not So Long a Way12/11/13 - Sen. Gillibrand and Rep. DeLauro to Introduce FAMILY Act Thursday! From our friends at the National Partnership for Women & Families: Nearly every member of Congress uses Twitter (and most candidates do too). That is why the National Partnership for Women & Families has created this new tool and website – www.WEtweet.org – which offers an easy way to find and tweet at elected officials and those running for office. 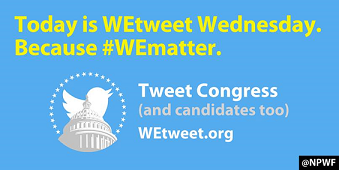 Visit www.WEtweet.org, pick the issue that matters most to you, enter your zip code, and then send tweets directed at your members of Congress and candidates. Please join on us on Wednesday, October 22nd, on what we’re calling “WEtweet Wednesday,” in an exciting day of action! Together we can send a clear message to those who seek to represent us: Women matter. Women’s equality matters. #WEmatter. Tax Season is Around the Corner - We Need Volunteers! Our VITA (Volunteer Income Tax Assistance) program provides extensive free tax preparation services and Earned Income Tax Credit (EITC) education and outreach throughout the Commonwealth of Pennsylvania, with a focus on promoting asset development and financial stability. Free tax preparation is supplemented by an extensive mobile tax program that brings these services to employer sites, community centers, public transportation sites and childcare facilities. The VITA program provides tax filers with tools and strategies that focus on using their refund to build year-round stability to achieve financial goals. To learn more about VITA, please click here or contact Maria Duncan-Prince by email or call 610-543-5022 ext. 239. UPDATE (10/16/14 1:27 PM) - HB 1796 has passed the Senate unanimously and is on it's way to the Governor's desk! Thanks to everyone for their support! The Consumer Financial Protection Bureau (CFPB) is getting ready to issue rules that could end payday lending nationwide. Payday, car-title, and high-cost installment loans with annual rates of 300% or more can put borrowers in an impossible (and unpayable) position. You can sign on today to a letter that will ask the CFPB to make a strong national rule that will help families everywhere. The letter is available at https://docs.google.com/forms/d/1JqUV_bXRrk7-AcnUmdvZ6E0F64q6hxvFmugAd34ud2Y/viewform. Sign ons are accepted until 5 PM today, October 16. As the letter states: "It’s time to end the scam and put rules in place that will end abusive practices and slam shut the debt trap." Let's work together to make that happen. Call Your Senators NOW About HB 1796! It's the last day of planned voting in the PA Senate, and HB 1796, a common-sense bill designed to protect domestic violence survivors from being evicted from their homes, is about to be amended to include pro-gun legislation. We probably don't need to tell you that a gun is the most common weapon used in domestic homicides. This legislation is being added to a bill that has already been amended to include anti-paid sick days language, yet another provision that would harm domestic violence survivors as well as many families across Pennsylvania. Please call your Senators NOW and ask them not to approve HB 1796 with these amendments! They are in session as we speak and need to hear from you RIGHT NOW.